City sign typed in Samogitian, it reads: "Telšė, the Capital City of Samogitia". Telšiai is a city in Lithuania. Having 29.107 inhabitants it is a 12th largest city in Lithuania and is an unofficial capital of Samogitia region. Telšiai is built on the seven hills and "envelops" Lake Mastis from its northern end; the centre and the recreational spaces of the city are located near the very northern shore of this lake. The city was named after a small rivulet, Telšė which flows into the Lake Mastis. A legend has it that a Knight named Džiugas founded the city. Telšiai was first mentioned in written sources around 1450. During the November Uprising in 1831 Telšiai became a sanctuary for Polish–Lithuanian partisans fighting the Russians. During the years of Lithuanian independence, 1918 to 1940, Telšiai grew rapidly. Several girls' and boys' high schools, a crafts school and a teacher's seminary were founded. The Alka museum was built, and several cultural societies were operated. During the first Soviet occupation, as a result of the Molotov–Ribbentrop Pact, Telšiai became infamous for the nearby Rainiai massacre, the mass murder of 76 Lithuanian political prisoners perpetrated by the Red Army during the night of June 24–25, 1941. Present day architectural monuments include Telšiai Cathedral and a rare surviving wooden synagogue. Samogitia Tourism Information Centre (Žemaitijos turizmo informacijos centras), Turgaus Sq 21 (centre), ☎ +370 618 63448 ([email protected], fax: +370 444 53010). M-Th 08:00-17:00, F 08:00-15:45. Provides information about Telšiai city, Telšiai district and general info on Samogitia. Sells souvenirs, postcards, books, Samogitian heraldry, traditional ceramics, tourist maps. Offer guide services. You can get to Telšiai by train or by bus from most other cities of Lithuania. The schedules for buses can be found at Bus Tickets website, schedules for trains can be found at LitRail website. Telšiai is small enough to cover on foot though public buses also go in the city. Turgaus square. editIt is a square in the middle of the old town. Here you can find a tower with a clock and a sculpture of the bear (Symbol of Samogitia and Telšiai). Close to the tower there is a fountain which symbolizes Telšė river. Here You can also find the only one sculpture around the world dedicated to Lithuanian Hound. Nepriklausomybės square. editHere all national festivals and official events take place. Here you can find monument dedicated to the memory of dead guerrillas of Telšiai who fought for the Independence of Lithuania. Telšiai Bishop Vincentas Borisevičius Priest Seminary, . editSeminary is located in the old bulding of Bernadine's monks as well as a new building which was built in 1928. Both buildings are connected among themselves and both are being used nowadays. From the top floor of the bew building you can get panorama of all the city. Church of The Assumption of the Blessed Virgin Mary into Heaven, Šviesos st. 2. editCurrent church was built in 1935. It has 3 altars. You can also find old paintings inside. Ortodox Church of St. Nicolaus, Žalgirio st. 8. editIt was built in 1937. It is the only one example of cubism architecture you can find in Lithuania. In the church you can find altar made in the middle of 19 century. Also books, icons, crosses and other items of sacral purpose have remained from the 19 century. A. Jonušo Samogitian-Japanese-Chinese Homestead-Museum, Muziejaus st. 88, ☎ +370 674 19308. editIt is a small private museum created by Samogitian jeweller - artist A. Jonušas. The visitors there can find a model of Horiuji pagoda temple, also the copy of the No theatre Okame mask, the scenic images of kabuki, Japanese theatre etc. The First School of Telšiai Town, Kalno st. 1/Katedros a. 3. editIn this building built in 1798 the very first school the town has worked. Whereas the students of it were active participants in the Uprising of 1831, the school was closed by the tsarist administration in 1832. The building was used as a school again in the middle-war period. In front of the building you can find not only the Cathedral but also a beautifull fountain with a sculpture on it. Walk around the shores of Lake Mastis. swim in lockal lake Germanatas. Cathedral square at night with a view to fountain. You can find many restaurants and cafeterias inside the city. Full list of them you can find here . Sinchronas Turgaus Sq 24 (centre), ☎ +370 655 50313 ([email protected], fax: +370 444 69994). Guest house with cafe, conference hall and Turkish bath. €41-55. List containing all options of accommodation can be found at the official accommodation list. 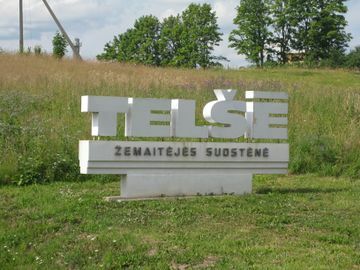 The Telšiai (both town and the district) phone code is 444 and the five digit local subscriber number. Kretinga, a town on the way to the coast. Palanga, SPA resort on the coast of the Baltic sea. Plungė, small city close to Telšiai with a famous manor. Riga, a capital city of nearby Latvia.